You’re on the hunt for the best life insurance policy to use for Privatized Banking. For this, not just any policy will do. You want to buy exactly the right kind of life insurance to get cash you can use, earn uninterrupted compounding, and have your dollars working in two places at the same time. Life insurance is a powerful product that can serve you in infinite ways at the same time. But designing a life insurance policy in a way that fulfills its potential has become almost a lost art. 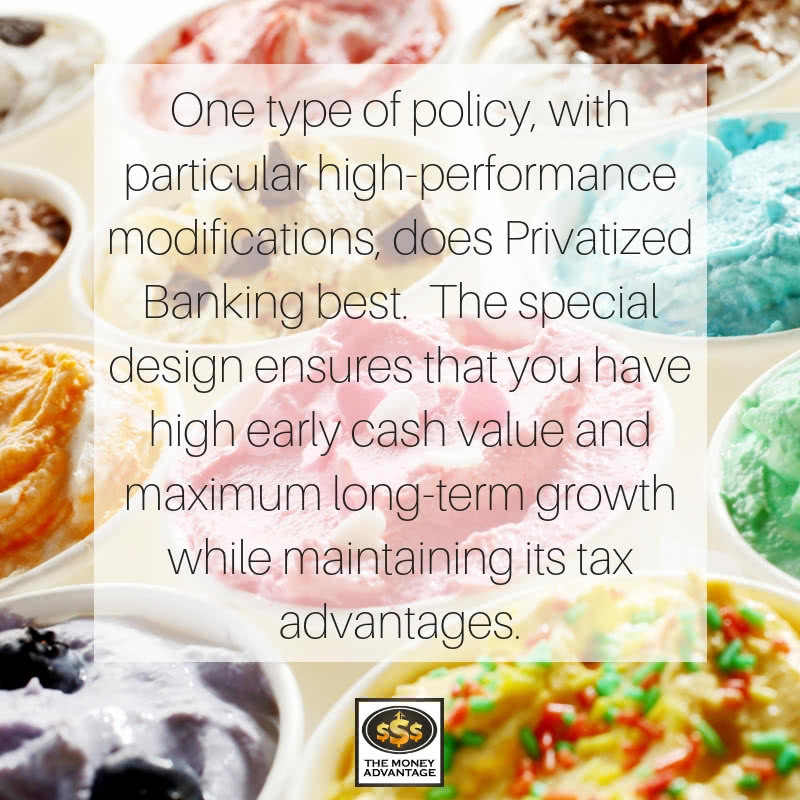 One type of policy, with particular high-performance modifications, does Privatized Banking best. The special design ensures that you have high early cash value and maximum long-term growth while maintaining its tax advantages. Let’s back up to gain some context. You already have the cash to begin investing. But instead of draining your savings to buy the investment, you want to maintain control of your capital. You know that you can maximize the long-term efficiency of your whole personal economy by using the Privatized Banking Strategy. With it, you get safety, growth, and access to your money. To implement this strategy, you’ll first store your capital in a life insurance contract. When you want to invest, you’ll borrow against your cash value, using a guaranteed loan feature. And when you repay the loan, you have the flexibility to choose a pace that works for you. Because you’re not using your capital, but collateralizing it, you’ll continue earning uninterrupted compound interest. Even while you invest, giving you returns in two places at once. Now that you’re ready to buy a policy to help you accomplish all that, what do you look for? If you’ve ever spent a minute shopping for life insurance, the process can be downright overwhelming. It’s easy to feel like the assortment of options is like Baskin Robbin’s 31 flavors. All might be good, but which one is best? What kind of life insurance policy do I need? What are the essentials to make sure the policy performs best? Can I use any cash value life insurance product? What makes the policy specially designed? How do I ensure it won’t take forever to build up cash value and I can use my cash quickly to invest in opportunities? We’ll reveal the design of the ideal life insurance policy for Privatized Banking. You’ll find out the three major types of life insurance, and why only one works for Privatized Banking. You’ll discover the only kind of life insurance company you want to work with. And you’ll learn what makes a policy specially designed so that it becomes a great place to store cash. You’ll gain a map to label all the crucial components of a Privatized Banking policy. Instead of being overwhelmed with minor details, you’ll know exactly what you want and what to focus on. And you’ll be equipped with purchaser prowess to quickly and easily determine if a policy measures up, so you don’t buy a policy that underperforms. Privatized Banking with Specially Designed Life Insurance Contracts (SDLIC) is just one step in the greater Cash Flow System. It fits into Stage 2, a part of keeping and protecting your money. We said before that Privatized Banking is like the peanut butter to your cash flow sandwich. It’s wedged between Stage 1 – keeping more of the money you already make – and Stage 3 – increasing your cash flow from investments. And it helps you do everything else better. Privatized Banking increases your financial efficiency, enables you to keep more of what you already make, amplifies your cash-flowing asset strategy, and accelerates your time and money freedom. Privatized Banking is the how of keeping and protecting your money. And specially designed life insurance is the what. There are three primary types of life insurance: term, universal, and whole life insurance. All types have a purpose, solving problems for a part of the population, but only one does Privatized Banking well. The first type is term insurance. It covers you for a specific timeframe, known as the term of the policy. The term is generally 10 or 20 years, but it can be as short as 1 year and as long as 30 years. During this term, it provides a death benefit to your heirs, if you pass away. That’s it. No bells or whistles. No cash value or benefit after the term is over. And no money back. The greatest advantage of term insurance is that it provides a lot of death benefit at a low premium, especially if you are young and healthy. But the downside is that if you buy a term policy, you’ll likely never get the death benefit. That’s because historically, only 1 – 2% of term policies pay out. The other 98% of policies expire while the insured is still alive, or they are converted to permanent policies. The actuarial data used to set rates does a great job of providing the best rates to people statistically likely to outlive the term. A term policy doesn’t vanish after the term. That’s because it often comes as a guaranteed renewable term policy, giving you the option to renew the policy at a new rate once the term is over, without having to go through underwriting again. However, once the term is up and you want to renew the policy, you’ll see a steep rate increase that will continue to rise each year. This is due to the annually renewable term policy that will be in force after the original term expires. For instance, one $750,000 term policy cost $606/year during the term. The owner, now age 59, facing an expiring term, had the option to continue the same policy at a premium of $22,000/year. When it comes to Privatized Banking, term as a stand-alone policy won’t suffice. With term, there’s no cash value to use – and cash value is the bread and butter of Privatized Banking. However, term insurance is a powerful supplement to maximize your coverage up to your Human Life Value right away. It lets you open future cash value policies, even if your health falters before you get that opportunity. You do this with a convertibility feature. This means you can convert the term policy to a permanent policy at any point during the term. At conversion, you would then pay a new premium, but get to keep your original health underwriting status. This is a huge bonus to someone who started a convertible term policy, who may later be diagnosed with a condition, and yet still maintains the ability to be rated with their original health status when they convert. This ensures they still qualify for coverage and will pay lower rates on the permanent policy. Universal life insurance originated in the 1970’s and 80’s. The coverage is built on an annually-renewable term life insurance chassis, with an accumulation fund that has additional ways to build up cash value inside. You can accumulate money tax-advantaged, but the cost of insurance increases each year, which may require an increase in premium to keep the policy in force. While maintaining a moderate price point, universal life has the potential to earn high rates. Premiums above the cost of insurance create cash value you can use. With universal life insurance, you have adjustable premiums and an adjustable death benefit. Universal life insurance comes in three main varieties: traditional universal, variable universal, and equity-indexed universal life insurance. Here’s a brief look at each one. With a traditional universal life policy, your premium grows interest-rate sensitive to create cash value. The policy is built upon the assumption of what interest rates will do in the future, to maintain the proper ratios of premium to death benefit, so the policy doesn’t lapse. If interest rates fall, the policy may require more cash than illustrated. Many unfortunate and unsuspecting people holding universal policies into their 70’s and 80’s discovered that lower than expected interest rates had failed to create the growth needed to maintain the death benefit. They found that they could not keep up with the increased premium cost. Many were forced to cancel their universal policies at a time when they needed life insurance the most. In the 80’s, the stock market took off, and people began taking cash out of universal and whole life policies and putting it into the stock market. Instead of giving up market share, the insurance industry responded by getting into the investment world. A new policy structure of variable universal life was born. In this product, cash value was not in an interest product, but placed into the stock market. Then, in 2001, with the dotcom crash, these insurance policies needed more premium to keep from lapsing. In addition to the flailing performance, these policies had more built-in costs, because there are investment costs along the way also. Another product was created in response to people losing a lot of money in variable universal life. Equity-indexed universal life seemed more appealing because it gave you access to market returns, without as much risk. Rather than have the market exposure of VUL, equity indexed universal life gives you a built-in floor and ceiling on your cash value growth. The floor protects your money from losing value, but you are capped on the upside. Rather than being invested directly in mutual funds, your accumulation fund is invested in an equity index account. Cash value growth is based on the performance of an index, although the funds are not directly invested in the stock market. EIULs still come with increased internal costs. To hedge against the loss, they have to use complex investing strategies using options, which run up operational costs. Owners of EIUL policies are counting on average rates of return. But returns haven’t been as high as anticipated. Additionally, if you borrow, or have lower performance than illustrated, the policy may require additional cash over and above the illustrated premiums. About the same time that universal life insurance came on the scene, variable life insurance was also introduced. Variable life insurance is very similar to variable universal life, but offers a fixed premium, a flexible death benefit, and the ability to earn a variable rate of return. 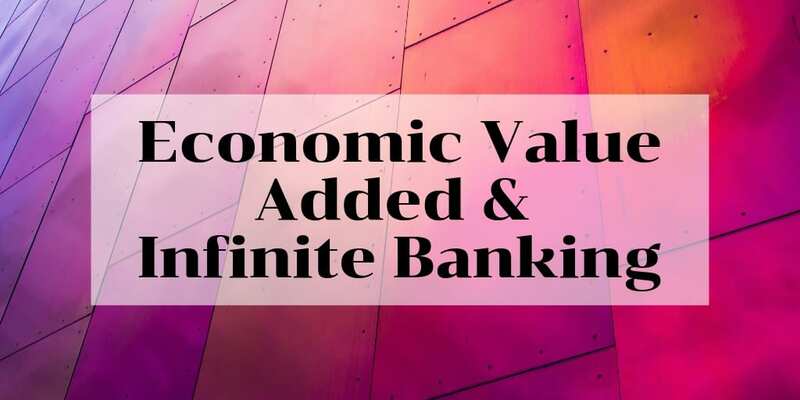 While universal and variable life insurance policies do have a cash value component, these policies are not appropriate for Privatized Banking. Privatized Banking requires a solid foundation of predictability, certainty, and guarantees, so that you maintain control. With universal life insurance, you don’t get 100% certainty that the cash value will remain steady, or that the premium illustrated will be sufficient. Therefore, you don’t have the performance guarantees that optimize your control. Whole life insurance is a truly permanent coverage. It has a guaranteed consistent premium, a guaranteed death benefit, and guaranteed cash value, throughout your entire life. Not only do you have a death benefit you can rely on, but you also have reliable cash value you can use while you’re alive. Let’s take a closer look at the guarantees. First, premiums are level. They’re guaranteed to never increase in order to maintain the death benefit. On the price-point spectrum, whole life starts higher than other types of life insurance. Actuaries determine the death benefit, based on what you would like to place into the policy. The 1-year renewable term is spread over the contract period (121 years), leveling out the cost of insurance over that time period. They know that early on, your insurance costs are lower, and as you get older, the costs rise. They spread these costs out over entire contract, giving you the certainty that your premiums are not going to increase. Then, the cash value grows with a guaranteed minimum return over time. Like building equity in a house, the cash value continues to rise over time until it equals the death benefit. Finally, as long as you keep the policy in force, it’s guaranteed to pay out. The “end” of a whole life policy is the “age of endowment.” This marker in a whole life policy is important, because it’s essentially a maximum life expectancy year imprinted on all policies. For instance, policies used to illustrate to age 100, but now have extended to age 121 in most cases, to account for increased life expectancies. If the policy owner reaches the age of endowment alive, the entire cash value will pay out to them directly. Privatized Banking needs guarantees in what your cash value will be, and whole life is the only life insurance product that can rise to this occasion. With whole life insurance, you have 100% certainty that if you put in what’s illustrated, the policy will perform as illustrated. Now, moving on to the good stuff. 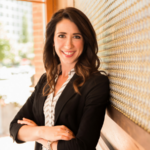 To maximize your cash value and usability, you want to ensure your whole life policy is specially designed, with a specific type of company, and specific high-performance modifications. There are two types of life insurance companies: stock companies and mutual companies. The category determines who receives the profits of the company and how that impacts your cash value. Stock companies are owned by the stockholders, while mutual companies are owned by the policy owners. A stock company has loyalty to stockholders and pays them dividends when the company is profitable. Likewise, a mutual company pays dividends when profitable, but to policyowners. In addition to dividends, policyowners also get voting rights in a mutual company. They can exercise their say in the leadership, ownership, and relevant decisions of the company with an annual vote. As a policy owner, you pay in a premium and gain ownership to a part of the company based on your death benefit. Then, at the end of the year, the board of directors analyzes their profitability. They first look at the cost to run the company. This includes maintaining the service force to service the policies from the headquarters, paying people who sell policies in the form of commissions, and calculating how much they paid out in death claims. Then they assess the input of premium and how it performed. Life insurance companies have a long-range, conservative investment structure that allows them to make performance guarantees. Most premium dollars are employed in highly-rated bonds – highly-rated corporate bonds, treasuries, and municipal bonds. The rest is deployed in real estate projects, with a tiny sliver in securities-related products. They determine profits, place a portion in reserves, and declare the rest as a dividend rate. The dividend is then paid to policyholders. Dividends are not a guaranteed part of the policy. Instead, they make up a part of your non-guaranteed portion of the illustration. However, because of the highly-controlled fiscal environment of a life insurance company, profits tend to mirror projections closely. Because of this certainty, dividends are highly anticipated to be paid out. This expectation is confirmed by the consistent payment of dividends every single year, even throughout the Great Depression, by the stable and long-standing companies that we do business with. Once the dividend is declared, the policy owner then has several options in how they would like to receive the dividend payment. The best option directly increases your cash value, while also adding more death benefit. And unlike a stock dividend, which can fluctuate in value after it’s assigned, a mutual life insurance dividend that’s added to your cash value sets a new cash value floor. The cash value can never drop below that line in the future. With specially-designed whole life insurance, you gain significant tax advantages. If the policy is utilized correctly, you aren’t taxed on the growth, and you can use it tax-free. For this benefit, you pay tax on premium dollars before you put them in the policy. Then, your cash value grows tax-deferred, so you don’t owe tax on the growth each year. You can use the cash value through loans completely tax-free. And when the death benefit is paid to your heirs, it’s completely income-tax-free as well. It’s a triple-tax advantaged asset that you pay tax on the seed, but not the harvest. However, there are two primary ways to trigger a taxable event inside of a specially-designed policy, and both are avoidable. One taxable event would be accessing cash value through withdrawals (different than a loan) above your cost basis (what you paid in). The other taxable event would be if your policy becomes a Modified Endowment Contract (MEC) by having too little death benefit to support the infusion of cash. If your policy becomes a MEC, the tax structure changes, becoming similar to a 401k or qualified plan, where you have to pay tax when you use your money. Policies are monitored with MEC tests to raise the death benefit correspondingly, so you overfund up to the maximum without crossing the MEC line. Let’s pull all these strings together into what’s required to ensure a policy performs best and delivers the control and certainty you need for Privatized Banking. We’ll create a sort of virtual reality map that will give you the ability to look at the real world with labels marking everything important. 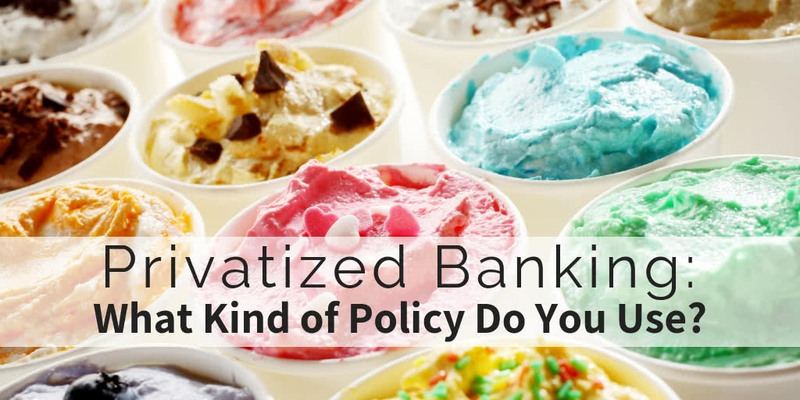 We want to help you recognize the 4 crucial elements of a Privatized Banking policy, so you can quickly and easily determine if the policy measures up and gives you what you’re looking for. Now that we’ve covered the basics, let’s dive into optimizing your policy. To perform Privatized Banking best, your policy needs a special design and modifications to jumpstart and accelerate early cash value. How Do I Build Cash Value Quickly to Invest in Opportunities? Whole life has fallen out of favor over the years because people have become enamored with rates of return. However, utilizing a specially designed policy with Privatized Banking gives not only competitive returns, but much more. You also gain uninterrupted compounding, certainty, and the ability to access your capital by collateralizing your policy. 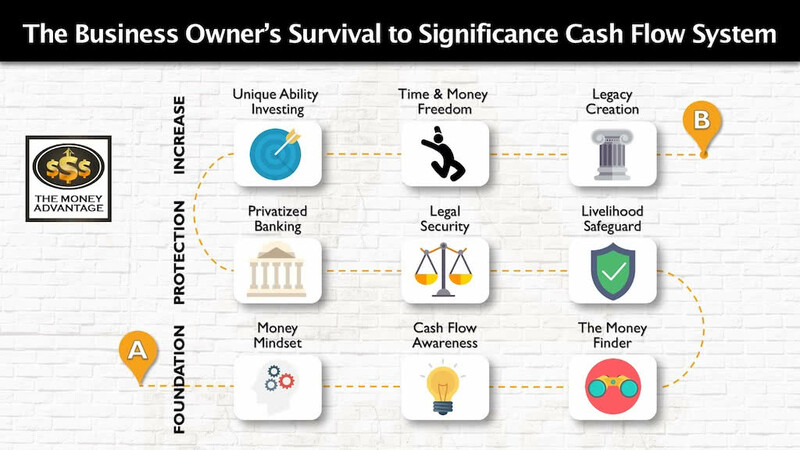 By keeping your own cash, and putting someone else’s to work in another asset, you gain the advantage of earning returns in two places at the same time. While a standard whole life insurance policy takes many years to build up enough cash value to write home about, a specially designed policy is different. With some intentional and strategic policy design, your cash value can quickly overcome the costs and exceed the amount you’ve paid in premium. The funding structure of a specially designed policy accelerates your cash value by combining three different types of premium within your policy. First, base premium provides a base policy and maximizes the death benefit. Next, a term rider boosts the death benefit to satisfy the MEC rules. Finally, level paid-up additions riders supercharge the cash value by purchasing little mini paid-up policies. Because you’re overfunding the death benefit, the death benefit continues to rise over time, while you’re also building cash value. While most people find it difficult to plan a specific funding level for the rest of their life, unaware of how their circumstances may change, there’s flexibility in how you pay premiums. It is possible to illustrate funding a policy for as long as your whole life, or in as little as 3 years. If you overfund early, you can tell the company to reduce the death benefit so that it’s fully paid up, with no more future premiums due. 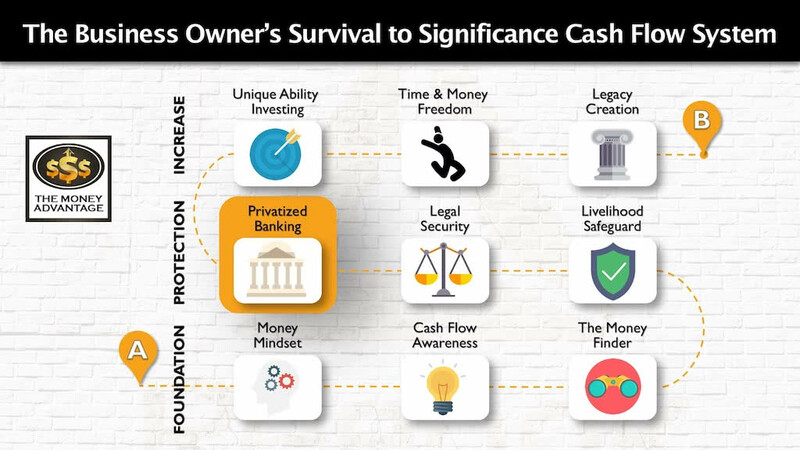 The goal of Privatized Banking is to maximize the cash value in the early years so you can be the bank, mimicking a place to store money like you’d store it in a bank. Why not store in a bank? Let’s look at the pros and cons of each in comparison. In a bank, your money is easily accessible, so you have control. It’s backed by the FDIC, so it’s generally safe. However, if you look at the reserves of the FDIC, they are minimal, compared to the deposits they back. If a crisis required using the FDIC to fulfill depositor’s claims, the government would print money to cover it, putting more money into circulation and causing inflation, so your money would be worth less. In a bank, you do get a rate of return, although, for most banks, it’s currently well below 1%. And you will have to put the growth on your tax return because it’s taxable. The primary downside of using the bank is that if you take money out, you stop earning a return on the portion you removed. The opportunity cost of using your cash is that you give up the compounding effect, and you’re never able to earn on that same cash again. In a whole life insurance contract that has been specially designed, the internal rate of return averages between 2-6%, at least 100X more than a bank. That growth, when designed and used properly, is not taxable. If you have cash value, you have collateral. By contract, to get access to capital, all you need to do is to sign a piece a paper requesting a life insurance loan up to your available cash value. You have guaranteed access to money. You don’t have to apply, verify creditworthiness, or prove you can repay. The insurance company will automatically send your money. Most insurance companies will say it takes 5 – 7 business days to get your cash into your bank. In our experience, it can be as quick as 48 hours. It’s easily accessible, but not “15-minute money.” It requires a bit more planning, but there’s no barrier to getting your cash, except the timeframe. You will be charged interest on this loan. Some people wonder why you would want to pay interest on your own money. Factually, you’re not. Rather, you’re paying interest to use the life insurance company’s money. If you have $100K cash value and request a $50K loan, the full $100K continues to earn interest and dividends. Why? Because you did not take your money out. You used your cash as collateral and took a loan from the life insurance company. This allows your money to keep growing, which is the ticket to uninterrupted compound interest. When it comes to repaying the loan, you get options there, too. You can choose to pay back all at once or on a schedule of your choosing. While interest does continue to accrue as long as there’s an outstanding loan, you have the option to let it accrue without paying it for a time, as long as you have a sufficient cash value buffer above your loan to prevent the policy from collapsing. Using Privatized Banking with life insurance is really about how you think. Everybody has banking in their lives. Banks are profitable. If you can recapture the banking function in your life, you can recapture some of that profitability, while at the same time, getting protection for your income. Today we’ve covered the basic elements that make up a Privatized Banking policy – a dividend-paying whole life insurance contract with a mutual company, that’s specially designed for high early cash value. It has guaranteed premiums, guaranteed cash value, and a guaranteed death benefit, paving the way to certainty and control. This contract grows tax-deferred and can be used tax-free, as long as the policy is used correctly and doesn’t become a Modified Endowment Contract. In Privatized Banking: High Cash Value and Long-Term Growth, we’ll reveal the exact funding ratios and high-performance custom modifications that you want to have in place to ensure your policy performs. We’ll also examine some of the more technical elements that often incite misguided attention and debate, and help you gain the ability to focus on what matters most. In addition, because life insurance doesn’t come as a one-size-fits-all, we’ll discuss the individualized element of life insurance, and why changes may be needed based on underwriting, health status, age, and objectives. Empowered with this information, you now have a choice. You can use these guidelines to go down the straight and narrow to a policy that’s designed to be used. Or you can take shortcuts and accept run-of-the-mill policies that will end up costing you more in the long run. If you’re shopping for your first Privatized Banking policy or adding on another policy, you have the framework to go from overwhelmed to crystal clear on exactly what you want. You’re able to make decisions quickly and easily, knowing how to focus on what’s most important instead of the minor details. 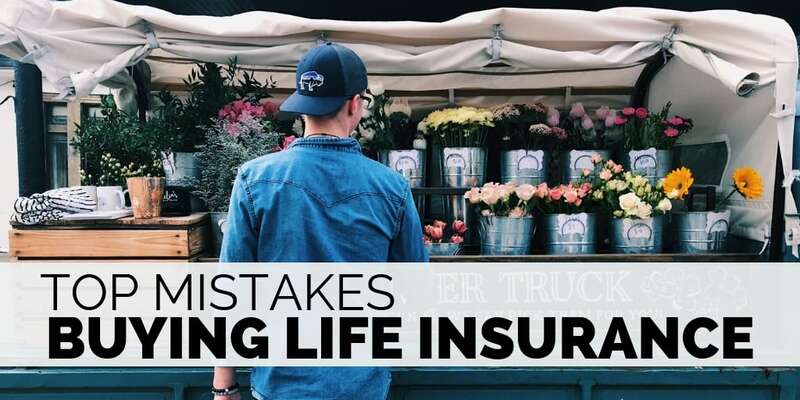 If you’re wishing you knew this a long time ago, and you already have a different type/design of life insurance, it’s not always a good idea to throw in the towel and start from scratch. Let us help you through a strategy to take the next best steps, starting from where you are. 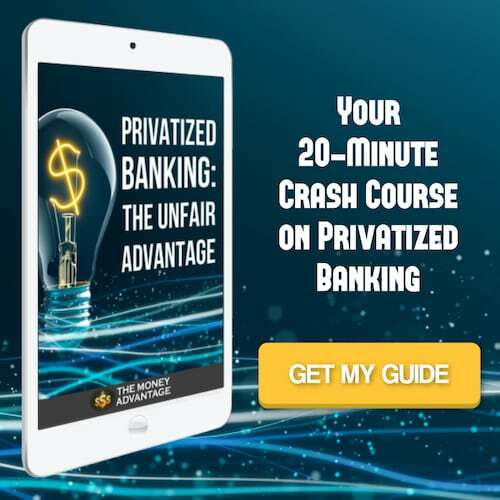 For more information on Specially Designed Life Insurance Contracts, get our free 20-minute guide: Privatized Banking The Unfair Advantage. Every person’s story, path, journey, and outcomes are different, and how you start, fund, and use your Privatized Banking system will look different from person to person. If you want to get started today, book a call with us to find out how. If you have great income, but limited cash flow, you may need to free up cash flow or get started before you’re ready. You can lock in your ability to start this strategy later with the right convertible term life insurance policy today. If you’re already saving each month, but you want a better tool to get higher, tax-exempt growth and greater accessibility, let us help you determine how to implement this strategy in your own life and improve every area of your financial life in one simple move. We’ll help you determine if you’re a fit for this strategy. No matter where you are today, book a Strategy Call with us to find out the one thing you should be doing to accelerate time and money freedom.